Once again, apologies for the length of time between updates. Was busy grinding for the rest of November with the prop bet, and have been doing a bit of house hunting recently as me and my girlfriend look to find a place a bit more suitable for a young child (not me, our baby). We actually found what looks like the perfect place today, so lets hope our application goes through successfully. It's such a pain in the arse being a Professional Poker Player in situations like this. I swear the estate agents would prefer you were on the dole, or perhaps a drug dealer of some sort, than being a Poker Pro. With no boss or accountant to speak of, I'm having to ship them 6 months worth of bank statements in an attempt to prove I actually make some money at this game. I don't really see why they should get to see what I've been spending my money on (fortunately I don't think I bought anything on sadomasochism.com recently), but as long as we get the house I suppose it doesn't matter. After playing 3700 SNGs over the course of the month, I was able to take down the prop bet I had going with Longy and Moon&Back on Blonde. The thread went down quite well, and is here if you are interested. I used this topic as the content for my most recent column on UK PokerNews so won't say any more about it, but will direct you to that column here. Still no news regarding the fraud on my Mastercard. The bank is "investigating". A mate has told me I should make a complaint if it takes too long so that they get their arses in gear. I might take this action soon as I really don't see why I haven't got my money back 4 weeks later (although in fairness they did say it would take 6-8 weeks to sort out. Slow goits!). 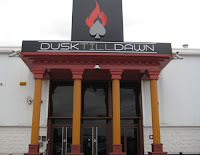 I ended up playing the Dusk 'til Dawn monthly £300 Deepstack event on Saturday. I played really well I thought, made a couple of nice moves, but after about 2/3 of entrants had fallen I picked up red Aces UTG, and after raising preflop had little choice but to move all in (against one opponent who had called my raise on the button) on the all spade flop. He also had little choice but to call with the stone-cold nuts, holding A9s. Fantastic. I shall be travelling to Ireland for the first time on Friday to play the inaugural event of the PokerStars UKIPT in Galway, so I'm looking forward to that. It's kind of a reward for working so hard in November. It looks a good structure and I've been reliably informed it's a soft tournament even without considering the inevitable plethora of online qualifiers PokerStars shall provide, so here's hoping I run good one time! 3 Comments to "Ship the prop bet..."
Good luck Sir, Enjoy the Guiness. James my friend, you are a sicko!